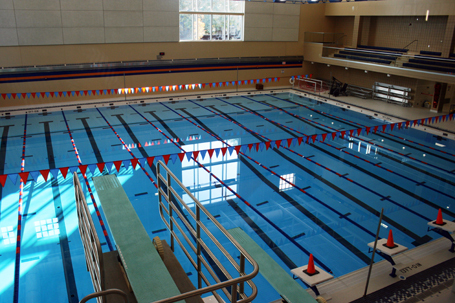 Combining the best of fitness, sports and recreation with a nod to leisure and social interaction, the new Leonard Center Athletic & Wellness Complex at Macalester College integrates a diverse audience and unique missions – education and health, competition and recreation. The Leonard Center appeals to all with state-of-the-art fitness equipment, fieldhouse, gymnasium, and a natatorium. Counsilman-Hunsaker and Hastings & Chivetta Architects designed the natatorium, which includes an indoor 25-yard by 25-meter pool with 1-meter and 3-meter springboard diving. The state-of-the-art pool provides a place for the men’s swimming and diving teams, women’s swimming and diving teams, and the women’s water polo team to practice and compete with local teams. Green architecture was an important consideration for the project. The new facility uses recycled materials throughout: Elevators run on vegetable oil; windows are placed to take advantage of light and heat; and the design allows for efficient heating and cooling.